The problem of waste that flows from the drainage channel in Kuta has not been handled. Whereas the case of pollution of liquid waste has occurred since two years ago. Badung Regency Environmental Office has done several actions, but not yet able to solve the problem thoroughly. The drainage channel in Kuta that has been contaminated with waste is pale white and smells sting, the waste is still flowing from the drainage sewer. However, the appearance of these fluids is only certain moments. If the waste problem is left unchecked and not handled seriously, the Balinese living in Kuta and working in the tourism industry become anxious about the image of Kuta, as it will be bad, and Bali will get a new title as a tourist destination that does not care about the cleanliness of the environment. Because in addition to polluting the river, it also directly damages the surrounding environment. If it flows into the sea, then the sea will be polluted and unfit for tourist attractions. Kuta residents have demanded the government to immediately solve the waste problem in Kuta is complete. The waste pollution case has been going on for years. 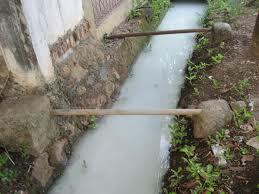 Citizens are hoping for the government to have the channel fully checked, so it is clear where the waste source is. Once the channel is closed or repaired and cleaned, residents expect the perpetrators of environmental pollution to be subject to strict sanctions and make the agreement in court. Cleaning and environmental issues is one of the focus of government programs that must be taken seriously in Kuta today. For that government, citizens, and the perpetrators of the tourism industry can synergize with the relevant agencies to support the program.